Accustomed to seeing rhubarb in fruit desserts, it may come as a surprise to learn that it is actually a vegetable. This is good news, however, as it presents a whole raft of additional uses for this exotically red food that is so abundant in spring when the foodscape is dominated by simple leafy greens. In this dish, for instance, rhubarb is lightly sauteed with breadcrumbs and a bit of agave nectar to make a crunchy, tart-sweet topping for tender beef and onions. In spring, it’s always handy to have a stash of “betwixt and between” dishes for spring days that bounce between warm and cool. This dish fills that bill, with the warmth and heartiness of a cool-weather stew combined with the vibrant flavors of fresh herbs and lime, topped off with the unmistakably spring flavor of tart rhubarb. In a further nod to seasonality, note that rhubarb, parsley and mint are all in their prime in the spring garden, as mentioned in the previous post on the joys of seasonal eating. Combine mushrooms and water in a small saucepan with a lid. Bring to a boil, then simmer for about 15 minutes, while browning beef. Remove mushrooms with a slotted spoon (keep for another use), then use broth as directed below. Heat oil in a large, heavy bottomed saute pan until hot but not smoking. While oil heats, gently squeeze blood from beef cubes, if any, then spread cubes across a plate, and sprinkle with salt and pepper. When oil is hot, carefully lay beef cubes across pan in a single layer. With heat on medium high, brown sides of cubes quickly, turning with a fork to brown two or three sides of each. As soon as a cube is browned, drop into slow cooker, before it has a chance to cook much further than the surface level. Use 1 ½ cups of mushroom broth to deglaze browning pan, then pour into slow cooker. Cover and cook on low 7 to 9 hours, until tender. In a large, heavy-bottomed, oven-proof saute pan, heat oil over medium heat until hot but not smoking. Add onions and saute about 10-15 minutes until browned and sweet tasting. Add turmeric and saute another 2 minutes, stirring a couple times. Add tomato paste and stewed meat from slow cooker, stirring until everything is well-combined. Reduce heat to low and simmer while preparing the rest of dish, stirring occasionally and allowing most of liquid to evaporate. Place parsley and mint in food processor, removing any very large stems. Add lime and remaining ½ cup mushroom broth and process until fairly smooth but with some texture remaining. Stir into onion-meat mixture, then cover pan and remove from heat. Preheat oven to 450 (F). In a second, large, heavy-bottomed saute pan, heat oil over medium heat until quite warm. 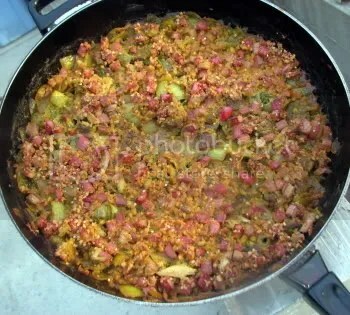 Add rhubarb and saute just 2 to 4 minutes, until it softens slightly. Stir in nutmeg, then breadcrumbs and saute another 1-2 minutes. Stir in agave nectar, then season to taste with salt and pepper. Sprinkle mixture evenly over onion-beef mixture, then place in oven and bake about 10 minutes, until gratin begins to brown slightly. Remove and allow to sit for 5 or 10 minutes, if possible, before serving. Accompaniments: For a light dinner, serve with just a simple salad of spring greens and carrots. For a heartier meal, serve with brown rice –or buckwheat for something even more adventurous. No Ovenproof Saute Pan? Pour the beef saute into an oiled casserole dish just before topping with gratin.